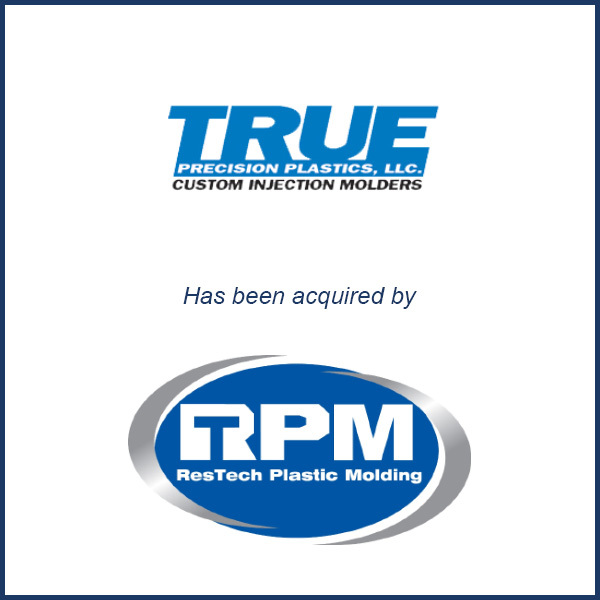 Lancaster, PA – October 2014 – Continuing its rapid expansion in the Eastern United States, ResTech Plastic Molding of Hudson, MA has acquired True Precision Plastics of Lancaster, PA. True Precision Plastics is a custom injection molder with 12 presses up to 360 tons and 20 full-time employees. It serves customers in the recreational vehicle, industrial electronics and consumer end-markets and specializes in high value-added parts and assemblies. ResTech Plastic Molding now has three strategic locations in New England and the Mid-Atlantic and a combined 83 injection molding machines from 24 to 500 tons. It primarily serves customers in the medical, aerospace, automotive and agricultural markets and specializes in high-volume precision components. Molding Business Services served as the financial advisor to True Precision Plastics in connection with its October 2014 sale to ResTech Plastic Molding. Read the entire Plastics Today Article here.